It’s all trade deadline, all week. Yesterday we discussed the initial reaction to the Mats Zuccarello trade. This morning it was the reaction to the rest of the deadline. Now let’s get into grading those three big trades. The whole deadline gets a B from me. There were no “WOW” deals, but that’s expected at the deadline. The Blueshirts moved their rebuild forward with another five picks over the next two years. They also have a good amount of deadline bait for next year to build out the 2020 draft. The 2018 draft saw the Rangers pick six times in the first three rounds. This year they have another six picks in those three rounds. That’s how you jumpstart a rebuild. "Grading the trade deadline for the Rangers", 5 out of 5 based on 18 ratings. Basically I agree with you Dave, but don’t suggest Nyquist is arguably better than Zucc — sure he is, long term because of his age … but as a playoff rental his value drops and Zucc’s increases. It’s really hard to grade these trades at least until after the draft as their we’re mainly picks here and the picks will determine how well we really did in these trades. That said I think you make good points on all the trades and the grades seem very fair. Were we going to sign McQuaid, Zucc and Hayes? Maybe Zucc, but probably not Hayes and definitely not McQuaid. We needed to get some tangible assets. While no real impact players, we could use some of our picks to jump up in the first or second round. We did okay, so B to B+ would be my rating. I would have liked to see us maximize the return by packaging these with a player like Names or Vesey, and getting a real good prospect in return, but I can only guess the deals were not there for such a trade. Gorton’s plan may be 2 years or 4 years or something in between. I can only hope he is gathering picks to support his longer vision of franchise wide growth. JG’s real plan: I’ll wait it out for two more years for the entire defensive to roll, because I can’t trade any of these guys, and I know it, and ope that Skjei comes around! Overall a B …. maybe a B+ if all the conditions fall into our favor! If the “conditions” fall in our favor it’s clearly an A- to A … and an A+ if Tampa wins the SC, Dallas gets by 2 rounds and resigns Zucc. That gives us 4 1st rounders this year and an extra 1st rounder for 2020. The Tampa deal would be a bonus but wasn’t tied into this deadline. Yeah A would be a better grade if the chips fall into place seeing the two main guys we traded didn’t cost us. Anything can happen in the playoffs, but I would be very surprised if Tampa did not win the cup.. ……The most difficult championship IMO is to win Lord Stanley. True Rocky , I think Columbus made some key moves and Nashville as well.We’ll have to wait and see what they can do. It was critically important that Gorton get at least a “B” grade for the trade deadline deals that he had to make. And a “B” is exactly what he deserves. All in all, a positive and necessary development in the rebuild. I was expecting more changes to the defense. I’m sorry that didn’t happen. I’d like to hear Jeff’s plan for fixing it because he doesn’t have the pieces yet. By the end of June the Rangers will have picked 7 (or 8) first round picks inside 3 drafts. That’s a lot. you’d have to think that would be enough to find at least 2 players capable of playing more than 100 NHL games. 7 50/50 tickets out of 93 sold. Hoping that the fruits of the last draft and trades start showing value next year. Can Libor Rydek play D for us? Will K’Andre Miller play only 1 more year for his college? Can we finally get the 2 Russians here? Are any of these guys game-changers? THese same questions will be asked next year at this time. I can only assume we pick a few blue chips that need at least a year. To me, this is all about 2020/21 season, making next year a year of growth. At the trade deadline next year will we be buyers or sellers? Yegor Rykov and Libor Hajek. I kind of combined them into one awful name. Not being in or watching Hartford games the word is he took a bit of step back this year (Hajek), that said he looked real good in camp this year … there’s also Lindgren who could be here next year. Re: Miller, I think he would benefit by one more year at Wisconsin … if they pulled him out I question whether he’ll get those top pairing minutes in Hartford. same for Nils Lundkvist, I can see him going another year in Sweden before coming over, he’s young and still 18. Clearly the d will take a bit more time to fix than the forwards — Staal, Smith and Shatty all have to go within the next couple of years … well they’re all FAs after the 2020-21 season. Maybe they could move one of them prior to that, but that could make quite a fire sale of d’men for the 2021 trade deadline. I think Zuc is coming back. The reason why i think so is the fact that the 3rd round pick turns into the 1st if Dallas resigns him. This is clearly an obstacle built in by Gorton to make sure Dallas is incentivized not to resign him. Why would you otherwise do it if not for the reason to try to bring him back? Dallas would be crazy to agree with it if this wasn’t intention communicated during the negotiation. We retained salary, he can’t come back … Hayes on the other hand could. Tanto – thought that was only for restricted FA ? I’m still confused about this rule as well – because I was too lazy to research it. sounds vaguely familiar that we can’t re-aquire him during the period when salary is retained but can sign him after the retained contract ends? IOW, the Rangers can resign Zuccarello because his contract will have expired. So, contrary to the prevailing belief here, Gorton’s decision to retain salary has absolutely no long term significance. I agree with the overall B grade. Unfortunately, Zucc’s value on the market was much less than his value to fans like me. From what I’ve read, he wanted a deal for a longer contract than the team was willing to offer. For a team that is rebuilding Gorton probably made the right move in view of Zuccarello’s age. He’ll be missed. The Hayes trade was apparently driven by the same term length disagreement. While I think that giving a longer term to a rellatively young player like Hayes is more sensible than an older one, 6 or 7 years at a high salary is a big risk. I don’t blame the Rangers for deciding not to try harder to resign Hayes. In Lemieux they obtained another player that plays with an edge, but apparently can also play the game. If they get a few guys like Tony DeAngelo and Lemieux who have skills and cajones, then they don’t have to waste a roster spot on an enforcer who can’t otherwise contribute. I think 2021-22 is when they turn the corner … no more Staal, Smith or Shatty to kick around (unless they can move 2 of the 3 before that) and guys like Lundkvist and Miller should be ready to really contribute. I may have gone with B+ for the McQ deal. We rented him during a season we didn’t need him and returned new possibilities during a different draft year PLUS a young player who has a blood line that more then likely could proof more value then his already bottom six with heart & soul skill set. I am excited about our locker room and it’s potentially, I thought the team showed something we haven’t had in a while on Sunday taking it to the caps (defending champs) on the ice and on the score board. a personal note, I attended the Saturday devils game, boy-o-boy NJ is bad, my point, can MSG please serve beer at all the stands even during family day, the lines at the limited stands were HUGE! Boo on the grade. The rangers dumped 3 players for 2 and have 5 picks in the coming drafts first two rounds. A goes to Gorton. And considering the market drop from all the other trades that happened the Rangers got in while the getting was good. Amid predictions that this coming draft will be the deepest in recent memory. The rangers struck gold. And opened up roster spots for the kids to grow. Now if we could just get Staal and Lundqvist to waive their no trade clauses we should be good to continue the rebuild. 2021-2022 I would expect a great showing from this team. With current yunguns, we are set. Very happy with where we are right now. On balance, I do not like the moves. 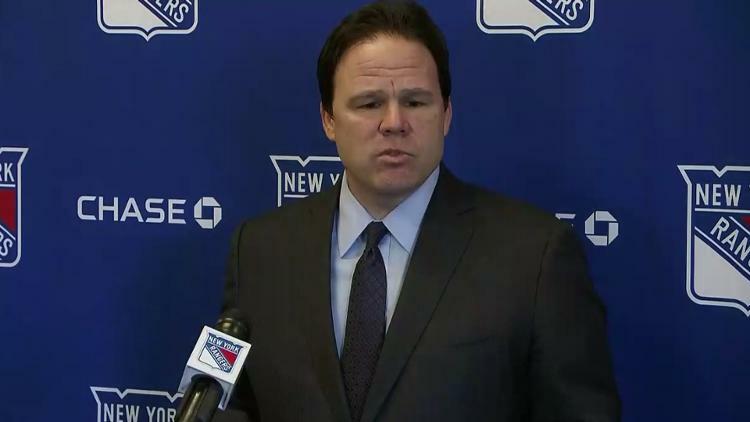 Gorton should have had more than rudimentary talks with Zuccarello. When the return was disappointing, he should have had more options than he did. Simple rule: If others undervalue your assets, you don’t trade them. Hayes was more complicated. I would have liked to keep him, but perhaps he was too expensive. I do think what he was asking was more reasonable than what the Rangers gave Spooner, Names, Skjei last year. As for this McQuaid deal, it was reasonable but on balance the Rangers essentially rented McQuaid for three quarters of a season in return for Kampfer and dropping down in the draft order. The player they got is truly meaningless – a warm body to help out injury-riddled Hartford for the remainder of the year who will return to Sweden after the season. But I do not like the idea of just amassing kids – the Edmonton model. The way to get players of the caliber of Zuc and Hayes is to keep the ones you have. They should have sat down and talked with Zuc way earlier. The five year deal that was talked about was a bit too long and more then likely they could have worked out a deal for both parties. I’m sure Zuc was upset they talked trade all season and then wanted ro talk a deal 5 days before the deadline. For a completely different perspective, I enjoy rooting for a team in part because of its players. I like Zuccarello. My joy in following the Rangers is much diminished by his trade. And indeed, if it increases the chances that the Rangers will win the Cup, I frankly don’t care. It is too high a price. If all that mattered to me is winning the Cup, I’d root for another team – a lot easier than rebuilding. Zuccarello was my favorite Ranger. I suspect that he was the favorite of many. However, it is quite possible from the accounts I’ve read that Zucc was stuck on a 5 year deal. As much as I love the guy at his age I can understand why the Rangers refused to go there if that was his position. I think we have very little to go on – AND, most critically, neither did the Rangers. Basically, we had an opening offer. And yes, barring injury, he is going to play at a high level for the next five years. Much less risk frankly than a five year contract for Skjei. Peter, if that rumor can be traced to Larry Brooks then we might want to look at it with some skepticism. I have a hard time trusting Larry who is capable of writing ANYTHING. Sorry Ray but I root for my team to win a CUP, and the players in our uniform are just a way of obtaining that goal!!!!!!!!! I don’t want to wait for another 70 years, I’ll be dead by then, and I suspect you will too. An understandable position — but my primary goal actually is just to enjoy life. And what is actually fun is rooting for the team and enjoying watching them play. The Cup is the objective, I agree, and I really loved 1994. But for me, it isn’t everything. I am both a lifelong Ranger fan and a lifelong Cub fan. My favorite Cub team was 1984, not 2016. As for the Rangers, I probably cared more about 1994 than those teams in the early 1970s that I listened to on transistor radios on stations 1000 miles away, but I am not sure. If I could promise you that the Rangers would win the Cup by playing a style that was literally as exciting as watching paint dry, would you actually watch the games? I don’t think I would. What would you call the teams coached by Torts? And yes I watched them, but more importantly, I rooted for them as well!!!!!!!!!! call me crazy… but i strongly think Quinn can turn Lemieux ‘s game around. I understand he has some skills…he’s young and DQ will help him with the discipline and dedication he may need, just a feeling. 5 sellers and 27 buyers, there will be no home runs. What did Stone bring back? Sellers got what they could, so from that standpoint, the Rangers did fine. It’s amazing to me how a lot of Ranger fans are saying that Hayes and/or Zuc should have been resigned instead of traded. For 7 and 5 years respectively? No way. And it’s not like it worked out for us when they were here. They were HERE, both of them, at the same time, remember? And where are we in the standings? Where would we be if they were resigned, in the same place. Too many thinking with their hearts, and not their minds!!!!! I agree whole heartedly Walt. I mean if all these Rangers are so great, then why are they a .500 team? What “all”? When people talk about resigning Hayes and/or Zucc, we’re talking about players who were PART of a winning team — a President’s Trophy and SCF team. Now that the depth of the team has been gutted (trading McD, Miller, Nash and even Grabner) you can’t expect the TEAM to perform as well — but should we blame guys like Zucc and Hayes? No, they did their PART and did it well. That still doesn’t mean I was necessarily in favor of resigning either one, but the idea of resigning either or both is not irrational in the least … especially Hayes. Where’s Mint’s #hawttaek on the Hayes trade? I disagree with all of this but, Jeff Gorton did a horrible job. If you want to just grade one day? Fine. But the failure to even talk to Zucc and Hayes till two weeks before deadline day was a blunder of huge proportions. Any leverage he had over other teams with Zucc and Hayes he eliminated himself. Other teams knew they weren’t resigning. McQuaid? You traded an asset that unnecessarily clogged and stunted your lineup nightly, and then on top of that managed to move backwards in the draft and lost position. The player acquired is already committed to return to Sweden so no he doesn’t count. He’s simple for Hartford and has less of an NHL future than all of us here put together. Jeff created a HUGE mess and simply just got his nose above water. Great job in self-preservation but the decisions that created the mss learned from? Yea no. John, there was communication prior to the trade deadline. The Rangers knew that term was going to be an issue with both of them. Whichever team signs Hayes long-term will hate that contract not too long after the ink dries. Maybe in the second half or the last 2 years or so of a 7 year contract, but I wouldn’t be so sure that Hayes will breakdown before the age of 30-31 … he’ll always be a big bodied crafty kind of player. Might I ad that if there really was an interest on the part of the players as well, they could have reached an agreement. We always blame management, but it’s a two way street, and if they really cared like they profess, a deal could have been struck!!!!!!!! Bergman might have indicated a desire to return to Sweden, but he can’t be committed as you say while he was under contract to Columbus …. and now that the situation has changed (the trade) he might very well want to give the NHL another crack.